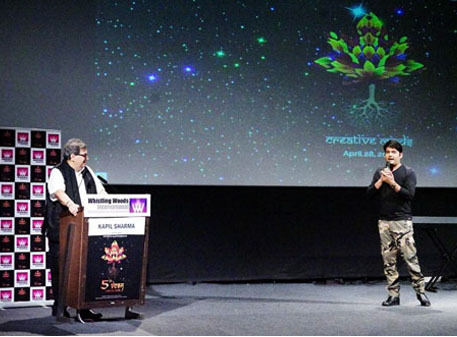 April 28, 2016: 5th Veda: This week, Whistling Woods International (WWI)s 5th Veda cultural hub saw none other than Kapil Sharma — the man with the funny streak who gets the nation laughing out loud. He left a crowd of 500 students in splits with his humorous performance. 5th Veda is a cultural hub initiated by Subhash Ghai, Founder & Chairman, WWI, to develop the artistic skills of budding filmmakers and media students. The mood was light and the tone candid as Kapil gave the audience a peek-a-boo into the story of his trip to success. One big take away for me in this journey has been to identify with ones strength. Staying genuine and strengthening what one is good at is the key to success in this industry where one will face several challenges, he said. The evening started with a short yet enlightening AV on the origin of comedy, stand-up acts and the best comedians from across the world and India. Subhash Ghai welcomed the comedy superstar, Kapil Sharma who took over the stage and what followed was a laughter riot in the auditorium. Subhash Ghai said, It is an honour to have Kapil with us today. I thank him for sharing his valuable insights and expertise with the students of WWI. The fun-filled evening of the 5th Veda session came to a close with Subhash Ghai & Meghna Ghai Puri, President, WWI, felicitating Kapil with a token of appreciation amidst thunderous applause.